Modern Home Design brought to you by Green Modern Kits. David Day and 3 North have partnered with Green Modern Kits to provide affordable, green, and modern home design solutions to prefab enthusiasts within the United States and Canada. All of our small footprint modern homes are passive solar and built with SIPs (structural insulated panels). casa ti: Imagine a 1,200 square foot, Three bedroom, one-story, passive solar home with gorgeous modern design, radiant heat, SIPs, and beautiful living flow. Click here! 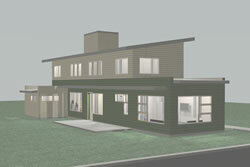 See our Net zero energy off-the-grid house prototype here. If you would like to be inspired, see our green architect, David Day Architecture's site. 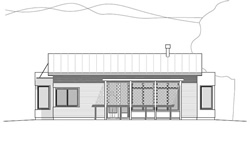 The R1 Residence: Larger, two story living: Radiant Heat, Passive Solar Design, SIPs, Grey Water Recovery System, natural ventilation / convection via Central “Stack” augmented by whole house fan. If you would like to be inspired, see 3 North's site. Imagine this... For You... Affordably.